If you’re wondering what L-carnitine is, why people supplement with it, and how it can benefit you, then you want to read this article. L-carnitine is finding its way into more and more supplements these days. If you listen to the hype, it’s a potent and versatile supplement that can confer a number of benefits, including more fat loss and muscle gain, better post-workout recovery, and increased cognitive performance. On the other hand, many people claim that it’s a complete dud and can’t do any of these things. Well, as you’ll see, the truth is somewhere in the middle. The reality is L-carnitine isn’t a wonder supplement, but science does show that it can be effective for certain purposes. And in this article, we’re going to break it all down. You’re going to learn what L-carnitine is, how it works, how it can (and can’t) benefit you, how to take it, and more. Why Do People Supplement with L-Carnitine? What’s the Clinically Effective Dose of L-Carnitine? What Types of Results Should I Expect From L-Carnitine? Does L-Carnitine Have Any Side Effects? What’s the Best Type of L-Carnitine? It’s “conditionally essential,” which means that your body can produce it as long as you’re also eating enough of two other amino acids that it can’t produce, lysine and methionine. L-carnitine serves several vital functions in the body, mostly related to the production of cellular energy. Thus, it’s not surprising that most of the L-carnitine in your body is found in your muscles, which have to be able to quickly generate a tremendous amount of energy. Why the “L” in “L-carnitine,” you’re wondering? Well, it simply differentiates it from another form of carnitine, D-carnitine, which not only has no known benefits but actually hinders your body’s ability to absorb L-carnitine. This is the same form of carnitine that’s produced by your body. This form of L-carnitine has gone through a chemical process known as “acetylation,” which allows it to pass the brain barrier. This form of L-carnitine is bound to tartaric acid to help improve absorption. This form of L-carnitine is bound to the amino acid glycine, and research shows it exerts antioxidant effects in the body and may be able to enhance blood flow while exercising. People supplement with L-carnitine to increase their body’s carnitine stores, especially the carnitine levels in their muscles. This, in turn, can produce a number of beneficial effects, including less muscle soreness, better post-workout recovery, and increased nitric oxide production. Most people’s diets are “healthy” enough for their bodies to maintain adequate levels of carnitine, but research does show that carnitine deficiencies are fairly common among the elderly and people that don’t eat meat. Thus, most of us fitness folk don’t need to supplement with carnitine for health reasons. Instead, we do it to boost our bodies’ carnitine stores beyond what’s normally attainable through diet alone, which can provide a number of benefits. 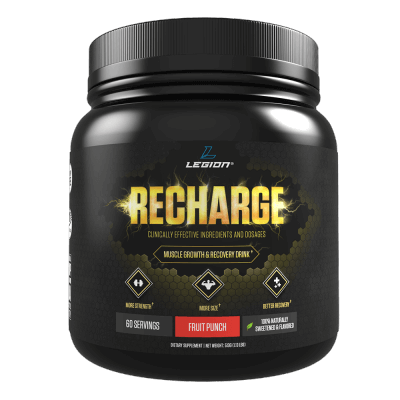 This is one of the most reliable benefits of L-carnitine supplementation, and that’s why you’ll find it in my post-workout supplement RECHARGE. Studies show that it reduces muscle damage during and after intense exercise, thereby improving muscle repair and reducing muscle soreness. Researchers are still figuring out exactly how this works, but the most likely hypothesis at this point is that these effects are mediated by an increase in blood flow to the muscles, which reduces oxidative stress and improves cellular signalling related to muscle recovery. L-carnitine is necessary for fat oxidation (burning), which is why supplement marketers often claim it helps speed up fat loss. Unfortunately, it’s not that cut and dried. While it’s true that a carnitine deficiency could make it harder to lose fat, most people aren’t deficient, and studies show that boosting carnitine levels beyond normal doesn’t increase fat burning. So, supplementing with any form of L-carnitine isn’t likely to help you lose fat faster unless you’re elderly or don’t eat meat (and even then, it’s questionable if it’ll make a difference). Some supplement companies claim that L-carnitine can directly help you gain muscle and strength faster, like creatine. Well, the only case I know of where supplementation with L-carnitine has directly improved muscle growth is in the elderly, and that was due to correcting a deficiency. Thus, it’s safe to assume that we wouldn’t see the same effects in those of us with normal carnitine levels. That said, L-carnitine supplementation can indirectly help us gain more muscle and strength due to its effects on soreness and recovery. You see, the less soreness you experience after training and the faster you recover from it, the harder you can train in your workouts and push your body in general. This, over time, can result in faster progress toward your body composition goals. Most research suggests that L-carnitine doesn’t improve performance of low-intensity, long-duration exercise. The same is true for short-duration, intense training as well. A few studies have suggested that supplementing with L-carnitine may increase power output, but the data is pretty weak so far. Last but not least, L-carnitine has been shown to reduce both mental and physical fatigue during exercise in the elderly, but not in young, healthy people. So, the bulk of the current scientific evidence says that, unfortunately, L-carnitine probably isn’t going to improv your exercise performance. Studies have shown that ALCAR can reduce fatigue and improve concentration in people with chronic fatigue syndrome or a carnitine deficiency. There’s also some evidence ALCAR may reduce the negative symptoms of ADHD. Many healthy people also report cognitive benefits with acetyl-L-carnitine supplementation, but unfortunately, there isn’t enough research on it yet to confirm or deny such claims. A few studies have shown that L-carnitine may increase insulin sensitivity in people with diabetes, but it’s unknown if it produces the same effects in healthy people. Several studies have found that L-carnitine can improve male sperm quality, and particularly in men who already have low sperm quality or infertility issues. The effective dose of L-carnitine depends on which type you use. That really depends on who you are. If you’re young, healthy, and eat a relatively nutritious diet, the main benefit you can expect from L-carnitine supplementation is less post-workout muscle soreness and faster recovery. It may also slightly increase your workout performance, but the evidence is fairly weak. If you’re middle-aged or older, supplementing with L-carnitine may also help you lose fat and gain muscle slightly faster and experience less fatigue in your workouts. And if you don’t eat meat, increasing your carnitine levels through dietary changes or supplementation can benefit you in the same ways as it does older people. Studies show that L-carnitine supplementation is safe and without side effects. This matter is controversial, however, due to a study published in 2013 that suggested that the carnitine in meat can increase the risk of heart disease. There’s a good reason to not buy into the hysteria, though: this research didn’t actually demonstrate that eating red meat increased the risk of heart disease. Instead, it showed that it caused a temporary increase of a substance known as TMAO, which has been associated with heart disease but hasn’t been proven to actually cause it. In other words, the idea that eating meat increases the risk of heart disease in all people under all circumstances is an unlikely hypothesis. This is further supported by the fact that studies have found no link between red meat consumption and heart disease, diabetes, stroke, or cancer. That said, there’s evidence that eating processed red meats like bacon, salami, and hot dogs, may increase the risk of heart disease, but we don’t know if this observation is related to red meat consumption per se or generally unhealthy living. L-carnitine is poorly absorbed, so you’ll want to use one of the other forms. My go-to is L-carnitine L-tartrate because it’s the form most associated with muscle- and recovery-related benefits, and that’s why I included it in my post-workout supplement RECHARGE. Furthermore, RECHARGE is naturally sweetened with stevia, naturally flavored, and it contains no junk fillers or artificial food dyes. L-carnitine is a worthwhile supplement, but not for the reasons that many people claim. It won’t help you lose fat or directly gain muscle or strength faster, but it can help you push yourself harder in your workouts and recover faster, which can mean better progress over time. So, if you want less muscle soreness after workouts and better muscle recovery, then it’s worth adding L-carnitine to your supplement regimen. What’s your take on supplementing with L-carnitine? Have anything else to share? Let me know in the comments below!